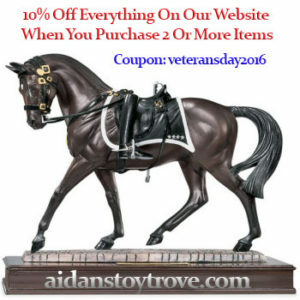 Home » Model Horse	» Veteran’s Day Coupon 10% Off The Website! Veteran’s Day Coupon 10% Off The Website! We have slowly been working at improving our website and I think that it is has come a long way! If you haven’t looked at our website recently, I encourage you to take a look. Shipping is now calculated by location and we have added a lot of new horses that were only offered on our Aidan’s Toy Trove eBay Store before. We are happy to pass the significant savings on to you if we don’t have to pay the high eBay fees! We are offering a Veteran’s Day coupon: 10% Off Everything On Our Website When You Purchase 2 Or More Items. The coupon code is veteransday2016. The coupon is good through Monday November 14th at 23:59PST. The coupon feature is new to me. If you have any problem using the coupon please email me aidanstoytrove@gmail.com and we will get it sorted out. « Breyer Gideon Is In Stock & On YouTube!